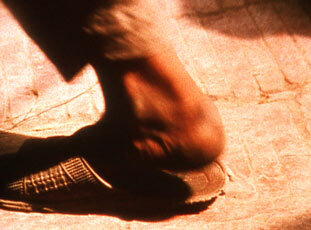 Alia Syed, still from Eating Grass, 2003, 16mm film, transferred to HD DVD, sound, 22:56 min. Los Angeles: In a far gallery of the Los Angeles County Museum of Art’s (LACMA) South Asian exhibition space is an installation somewhat out of step with the space’s other offerings. The South Asian collection at LACMA, housed on the fourth floor of the Ahmanson Building, is renowned for its Hindu and Buddhist sculptures, its Indian paintings, and its impressive array of decorative arts, dating largely from the pre-modern period. First-time visitors to the space may find it unexpected, then, to step in the far gallery and into a contemporary film installation – that of Alia Syed’s 2003 twenty-three minute video, Eating Grass. As such, the film offers an intervention into the otherwise largely encyclopedic model of LACMA’s South Asian collection. Alia Syed, born of Indian and Welsh descent and today based in London, works mainly in the medium of film. She trained in the United Kingdom and has exhibited widely in Europe and North America, with shows in New Delhi and Sydney as well. Her work deals with themes of identity, with public and private space and their boundaries, with speed and stillness and the pace of days and of our social and private selves within these rhythms of light and darkness. Visually, Eating Grass relies on impressions and on shadows; aurally, it is a swirling, dizzying but captivating mix of English overlaid onto, but not directly in-sync with, Urdu. 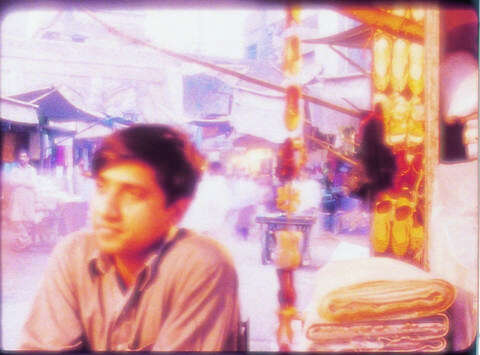 Filmed in London, Karachi, and Lahore – one city, Syed has said, falls into another – Eating Grass is organized around the five daily prayers of Muslim traditional practice. Syed, who is also a poet, compliments this pace of the day as punctuated by calls to prayer with an underlying poetic and lyrical rhythm. As per a 2012 interview with LACMA assistant curator Julie Romain, Syed originally wrote a short story in relation to the early morning call to prayer, inspired by her realization one day in Karachi that the call she had originally taken to be the traditional one of a muezzin was actually a distorted tape recording. She then went on to write four additional short stories that relate to the remaining daily calls to prayer; together these five visual and audio vignettes comprise the film. Calls to prayer, Syed has stated, serve as access points to memories. The stringing of these memories together in and through our daily lives results in a feeling of continuity; it is this flow she calls upon in the film. In an October 2, 2012 guest lecture given to art history students at UCLA, Syed suggested that the viewers allow themselves to “feel” the film, to follow it in a dream-like manner, rather than attempt to intellectually trace or decipher its meaning. Such instruction frees from viewer from attempting what tends to come naturally – finding a pattern or inventing a story – and allows him or her to instead give in to nuance and impression. Visually, the film has a “ghosted” appearance – a result of her filming and processing technique – that emphasizes a realization of the very real presence memories have as they juxtapose themselves in our daily lives. The lyrical rise and fall of the audio – comprised of English and Urdu voice-over – follows its own cadence. The two languages are not quite direct translations, do not quite line up either in meaning or in pace, and therefore portray both the disconnect and the complexity of language. Life, Syed has beautifully said, is littered with intimacies; this may take the form of a stranger on the bus with whom one has, at a distance, developed an imagined affinity with, or of a sound or smell that suddenly connects one’s immediate reality with some distant past. Her film Eating Grass, gives visual and aural form to these intimacies, places them within the flow of a day, and recreates the experience of the drift between public and private, outer and inner, realities. Throughout, Syed’s work recalls both the delicate balance and the inherent instability between the two worlds. Tracy Buck is currently pursing a PhD in Art History at the University of California, Los Angeles. She holds MA degrees in South Asian Cultures and Languages and in Museum Studies, and has worked in the Collections Management and Curatorial departments of several history and art museums in Seattle and Los Angeles.